The World Track and Field Championships are currently taking place in Osaka, Japan. As you'd expect, there have been some close finishes and some runaway victories. Since I was a kid, I've been fascinated by the photos showing the finishes in the running events. Produced by a special camera, these photos depict multiple images of the contestants as each reaches the finish line onto one master image with timing coordinates. 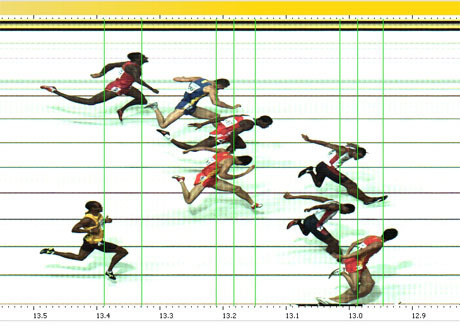 Thus, the composite photo-finish picture conveys a lot of information: it shows each participant at the finish line with his time and position. Plus, the overall picture shows top athletes competing to be the best, which in itself can be both dramatic and inspiring. For example, above, China's Xiang Liu in the bottom lane wins the 110 m. High Hurdles. His time (12.95) can be determined by drawing a vertical line from the forward point of his torso (here his shoulder) down to the time scale. Second place went to Terrence Trammell (USA) in 12.99. In the photo above, USA's Jeremy Wariner wins the 400 m. run going away with a very fast time of 43.45. Second is LaShawn Merritt over a half second behind in 43.96. The eighth place finisher (far left) crossed the line in 45.40. Thus, the photo shows multiple exposures over a two second period. The closest race of the meet was the Women's 100 meters, shown below. Notice how close the vertical lines are in the photo-finish. After five minutes of deliberation, it was determined that Veronica Campbell (Jamaica) in lane 7 won in a time of 11.01. Lauryn Williams (USA), lane 4, was second also in 11.01. How you lay your body out — especially your torso — can make all the difference in the world! These are lots of fun. They're the kind of "diagrams" that "information-visualization" expert Edward Tufte gets off on. It's very interesting to know about these photo finishes! Making an analogy with the business world, in races as in customer satisfaction the smallest detail can make the whole difference. Thanks Roger! As a proud Jamaican, I have to point out that Veronica Campbell is from and competes for Jamaica, not Canada. Harold: I agree: these photo-finish "diagrams" are information rich. Jorge: Thanks for stopping by. Small details do make a big difference. Michael: Thanks for the correction (since made on the main post). I must have had Canadian sprinters on the brain this morning. Congratulations to the Jamaican sprinters. BTW: The 4 x 100 Women's Relay between the United States and Jamaica should be quite competitive. It would be interesting to graphically display the results of election races in a similar manner!